The Montreal Protocol on Substances that Deplete the Ozone Layer has been in the news a great deal recently. This is something quite unusual for a ‘lesser known’ convention. But how has this landmark environmental treaty, which some see as the most successful international agreement of any kind, managed to effectively halt the destruction of the ozone layer as well as making a huge contribution to combatting climate change? Dedicated and vigilant Customs officers – that’s how. The stratospheric ozone layer is the thin layer of the atmosphere that protects life on earth from harmful ultraviolet radiation from the sun. The objective of the Montreal Protocol is to protect human health and the environment by phasing-out the production and consumption of nearly 100 industrial chemicals known as ozone depleting substances (ODS), which include chlorofluorocarbons (CFCs), hydrochlorofluorocarbons (HCFCs), halons, methyl bromide, carbon tetrachloride and methyl chloroform. Under this treaty, developing and developed countries have equal but differentiated responsibilities with both groups of countries having binding, time-targeted, and measurable commitments. The Montreal Protocol has been ratified by 197 Parties, making it the first universally ratified treaty in the history of the United Nations (UN). The treaty has been successful in phasing out more than 98% of ODS, and it is expected that as a result the ozone layer will recover to its pre-depletion levels by around 2060. In addition, due to the phase-out of ODS, many of which are powerful global warming gases, the Montreal Protocol lowered greenhouse gas emissions by the equivalent of about 11 gigatonnes (11 billion tonnes) of carbon dioxide per year – a truly huge contribution to protecting the earth’s climate. © IISD/Kiara Worth – The Parties to the Montreal Protocol applaud the historic decision to phase-down the production and consumption of hydrofluorocarbons (HFCs), which are powerful climate change gases. When those familiar with the Montreal Protocol consider the work of Customs officers in relation to this environmental convention, what may first come to mind is the central role they play in the detection and prevention of the illegal trade in ODS. 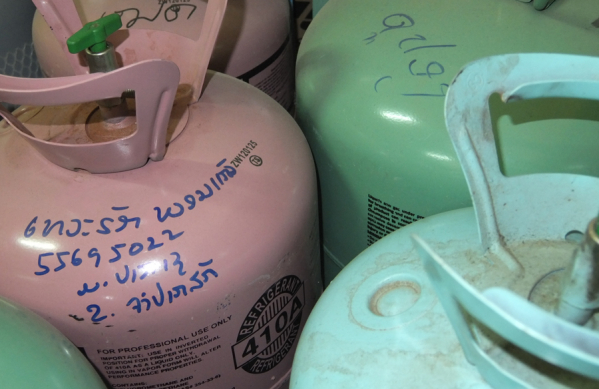 Smuggling of CFCs, HCFCs and other ODS has been a significant problem which threatened to undermine the success of the Protocol, but significant seizures of these chemicals by Customs officers around the globe regularly hit the headlines. It has been estimated that in the early 2000s, the illegal trade in ODS represented around 10-20% of legitimate trade, with an approximate value of between 25 and 60 million US dollars a year. Important though this work on illegal trade is, to focus only on this part of the function of Customs would be to neglect the arguably more important, but perhaps less visible work of Customs, which is fundamental to the success of the Montreal Protocol – the day-to-day work of monitoring and reporting trade data on which a country’s compliance with their commitments under the Protocol is based. While the Protocol deals with the production and consumption of ODS, in reality, this ‘consumption’ is not measured in situ, but is calculated from countries’ ODS import, export, production, and destruction figures. It is clear that to ensure accurate and timely reporting it is essential to have detailed and accurate import and export data, which is the domain of Customs. They must also ensure, by working closely with the designated national authority, that imports and exports of ODS are only allowed to proceed according to the national ODS licencing system and associated import and export quotas for each specific controlled substance. One of the requirements of remaining in compliance with the Montreal Protocol is timely annual data reporting, and another is ensuring that a country’s imports and exports remain within the agreed ODS phase-out schedules. Both these requirements would not be able to be fulfilled without dedicated Customs officers. OzonAction, a branch of United Nations Environment, assists developing countries and countries with economies in transition to achieve and sustain compliance with the Montreal Protocol. One of its priority areas of work is to provide capacity building support to Customs and other enforcement officers to assist them in their work. For this reason, OzonAction has developed a dynamic configuration of 10 regional networks comprising 147 developing countries, supported by staff located in regional offices who interact closely with these countries on a daily basis. The regional networks provide a regular, interactive forum for officers in National Ozone Units – country representatives responsible for the implementation of the Protocol – to exchange experiences, develop skills, and share knowledge and ideas with colleagues from both developing and developed countries. These networks also provide a platform for interaction with, and the training and capacity building of, Customs and enforcement officers. The networks are considered a cornerstone in the success of the Montreal Protocol. After more than seven years of intense and sometimes difficult negotiations, the historic decision taken by the Parties to the Montreal Protocol in October last year in Kigali, Rwanda which hit the headlines was that they had agreed to phase down the production and consumption of hydrofluorocarbons (HFCs) also. To appreciate the significance of this agreement, one needs to reflect on the fact that this is a treaty dealing with ozone depletion, addressing a group of chemicals which are not ozone-depleting. The ‘Kigali Amendment’ will require all countries, both developed and developing, to phase down HFCs following various specific schedules. These chemicals are commonly used alternatives to ODS, and while not ozone depleting substances themselves, they are greenhouse gases which can have high or very high global warming potentials (GWPs) – about 121 to 14,800 times more powerful than carbon dioxide in causing climate change. It has been estimated that this agreement will help nations avoid up to 0.5° Celsius of global warming by 2100, which very much continues the historic legacy of the Montreal Protocol. However, the work to achieve this target is all still to be done. Once again, Customs officers will be called upon to play their indispensable role. It will soon be necessary to monitor and control the trade in HFCs as the import and export of these substances comes under regulation, and quotas are issued. It will be necessary to identify and distinguish HFCs from their alternatives and other chemicals. The latest edition of the Harmonized System (HS) released in 2017 does not include specific codes for HFCs, but they are expected to be included in the 2022 edition. This may present a particular challenge as countries are required to establish working licensing systems for HFCs by 2019, although controls for developing countries do not follow this for some years. © Ezra Clark – The import and export of ozone depleting substances is already controlled under the Montreal Protocol, however, hydrofluorocarbons (HFCs) such as R-410a (pink cylinder) will soon be subject to trade controls as a result of the ‘Kigali Amendment’ to the Protocol. 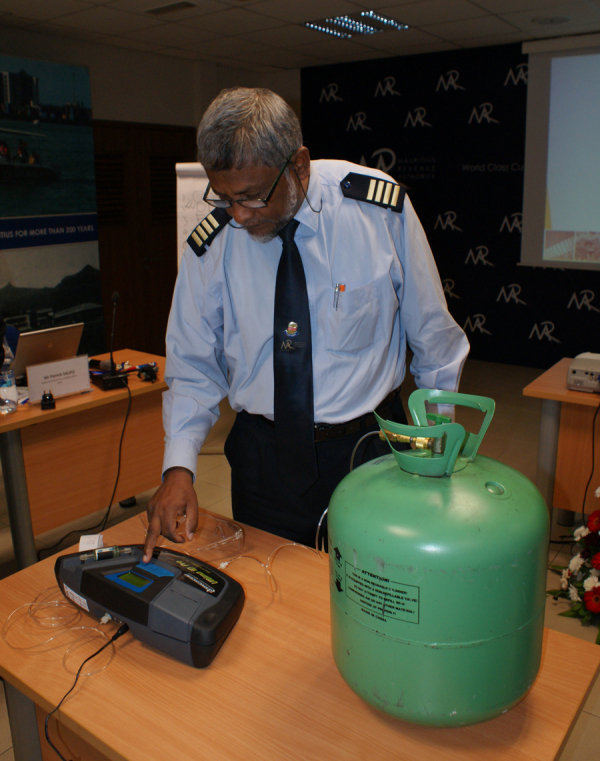 © Ezra Clark – UN Environment’s OzonAction branch has provided training and capacity building to Customs officers for many years on the implementation of the Montreal Protocol, including training on the use of ozone depleting substance identifiers. For many years, OzonAction and the WCO have collaborated on developing and deploying innovative information material and training tools, such as e-learning modules which are available on the WCO CLiKC! Platform, and cooperated in the carrying out of enforcement operations and intelligence-sharing exercises that have specifically targeted the illegal trade in ODS. These actions have cemented the strong ties between OzonAction and the WCO at the international level, while having a positive impact at the national level. OzonAction currently has projects in some 100 developing countries. These projects include support for Customs officers, by way of capacity building, training and the provision of information material. By ensuring that Customs and enforcement officers on the frontline are well informed about these new chemicals and remain vigilant, United Nations Environment is confident that the success of the Montreal Protocol will continue to be underpinned by the tireless work of Customs officers. Continued cooperation between OzonAction and the WCO will support this even further.